Pain receptors are the same in the pediatric patient compared to the adult. There is not more or less pain but they do have increased fear and anxiety. 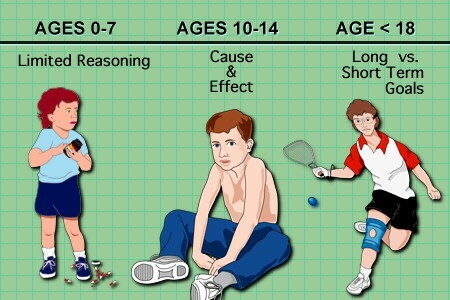 Most children cant reason at all until approximately seven years of age and most are in the 10-14 age group before assessment and outcome expectation become a habit. Clearly many adolescent children up to 18 years or better have difficulty distinguishing long term and short term gains and goals. One cannot expect in the children the same measure of control found in adults, even with the same discomfort. 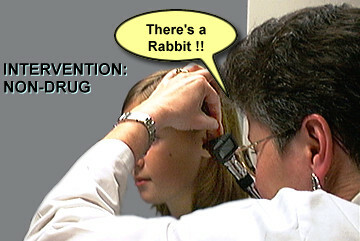 This results in a noisy practice since analgesia is not required for each tympanic membrane inspection or immunization. Nevertheless, the pain of trauma, surgery, chronic disease or invasive procedures should be relieved or prevented. This part of the module will address pain assessment and management in the child with cancer. The goals of therapy when treating children are the same as those used in teaching adults. However, an additional goal when treating the pediatric patient is to offer relief and solace to the parents or guardians. It is a terrible event for a parent to have a child in pain. The neuroanatomy and pathophysiology is the same in children as adults. The children frequently display idiopathic or psychogenic pain as an expression of their anxiety and fear about what is happening. They readily pick up the anxiety and depression of their parents. 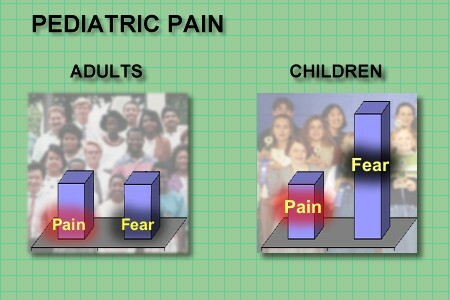 The patterns of pain in pediatrics are the same as seen in adults. Any of the cancer pain syndromes could occur in children but they are unusual. The most common pain is bone pain. This occurs particularly in the leukemia, neuroblastoma, rhabdomyosarcoma and osteogenic sarcoma. Leptomeningeal tumor spread does occur in the acute leukemias, especially acute lymphocytic leukemia (ALL) but also in head/neck lymphomas or rhabdomyosarcomas. 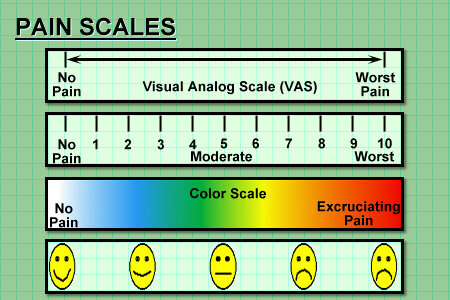 Local treatment, if possible, results in the best control of this pain. Local radiation or intrathecal chemotherapy are frequently used. However, bone pain from tumors unresponsive to therapy is a major problem and one in which pain control is the goal, not disease cure. Post chemotherapy neuropathy pain does occur in children but not often. The problems of stump pain are the same as adults. The same assessment plan used for adults can be used in children. Keep in mind the parent will be answering most of the questions and this can be both a hindrance and a help. In the psychosocial assessment it is well to remember that what the child should be doing is playing as in school. School aged children isolated from their peers frequently become depressed. Non-pharmacologic methods are well known to those who take care of children, be it parent or physician. Counter irritation is exactly what it says; apply pressure or rub an area adjacent to site or intended site of injury. Physical therapy can play a vital role, especially in fractures or peripheral nerve injury. Physical therapy can include therapeutic exercise, massage, hydrotherapy (warm or cold applications), ultrasound and Transcutaneous electrical nerve stimulation (TENS). A TENS unit delivers a very mild electrical stimulation to painful area. This is thought to stimulate release of endogenous analgesic substances or change the bodys perception of pain from the affected area. As in treatment of adults with pain, the first line of therapy are the nonsteroidal antiinflammatory drugs (NSAID's). They are thought to interfere with formation of cyclooxygenase (COX) products which are produced in injured peripheral tissue. COX inhibitors should be prescribed with care given recent findings. These products appear to contribute to local erythemia and to sensitize nerve endings. 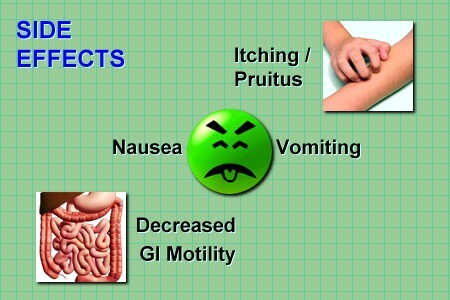 NSAID's have the same toxicities in all age groups i.e. hepatic and renal and should be used with caution in patients with damage or disease of these organs. Severe pain, especially bone pain, will not be controlled by NSAID's. It will be necessary to use opioids. The potential side effects include pruitus, nausea and vomiting, and decreased gastrointestinal motility which can lead to a distended abdomen or constipation. The cardiovascular and respiratory depression are similar to what is seen in adults. It is best to titrate the dose. Observation of the child will usually reveal to the physician if the pain relief is adequate. The child will not have a tranquil look on his face or smile while he is stating he is in pain. Most of the children have very little guile. If in pain they tend to be irritable, restless and wont look at you. It is a normal tendency for physicians to under medicate because of fear of cardiovascular or respiratory depression or addiction. If the child has terminal cancer, addiction is not a valid reason to withhold medication. Tolerance to opioids also develops in children. Because of pharmacokinetic differences in young infants, in non ventilated infants less than six months of age, one should use one-fourth to one-third of the initial calculated mg/kg dose recommended for older children. Caution is indicated when administering opioids to debilitated or impaired patients, especially in combination with order sedative agents. Sometimes, however, it is helpful to use an antianxiety agent or a tricyclic compound for depression, especially in the adolescent child. An NSAID can be used in conjunction with an opioid because of its "opioid sparing" effect. Patients treated with Opioid/NSAID combination require less opioid. The opioids can be administered IM, IV, oral, intraspinal, and intraarticular. Transdermal products are available. Other drugs not typically considered analgesics can be helpful. Neuropathic pain can sometimes be relieved by anticonvulsant (carbamazepine, phenotoin, and clonazepam). Benzodiazepines listed here (diazepam, midazopam and lorazepam) are useful amnesiacs and anxietytic agents. Patient-controlled analgesia (PCA) can be used even in a patient as young as six years. The patient triggers a microprocessor-controlled infusion pump. Analgesia is established then the patient initiates additional doses within confines of prescribed dosage (0.02-0.04 mg/Kg) with a minimal dosing interval (lockout interval) and a four hour dose limit. Both parent and child must understand the technique but the child should be the one pushing the button. This can be used in the home, preferably with Home Health Care supervision, as well as the physician.